The Romney campaign issued a 30 second ad, which focused on what the presumptive GOP nominee would do on his first day in the White House. The Daily Rundown's Chuck Todd reports. The lessons we learned this week on four stories -- Bain Capital, Romney’s $40 million, Jeremiah Wright, and the debt ceiling… Romney goes up with his first general-election ad… And it has a (small) Spanish-language component… Listing the 10 hottest ad markets right now… The culture war (abortion) resumes.. Jim DeMint’s rough week… Americans Elect was a bust… And the NC GOV ad war. *** Four lessons we learned this week… : There were four big political stories this week, and we learned something important from each of them. The first was the introduction of Bain Capital into the general election. While some of the attention focused on former White House adviser Steve Rattner calling the Obama ad unfair and the president’s subsequent fundraising on Wall Street, we learned that Romney still doesn’t have a solid response to this issue that hurt him in 1994 and hurt him in South Carolina 2012. “There's this fiction that some have that somehow you can be successful by stripping assets at enterprise and walking away with lots of money and killing the enterprise,” Romney said yesterday, per NBC’s Matt Loffman. “There may be some people that know how to do that. I sure don't.” But the examples of GTS Steel and especially Ampad tell a different story. That said, the Romney camp’s web video pointing out that the auto bailout ended up hurting Delphi employees is a pretty solid counterattack and a reminder that there are some similarities in what the Obama administration did with GM and Chrysler to what Romney sometimes did at Bain (though Obama never personally profited from the auto bailout). Republican presidential candidate, former Massachusetts Gov. 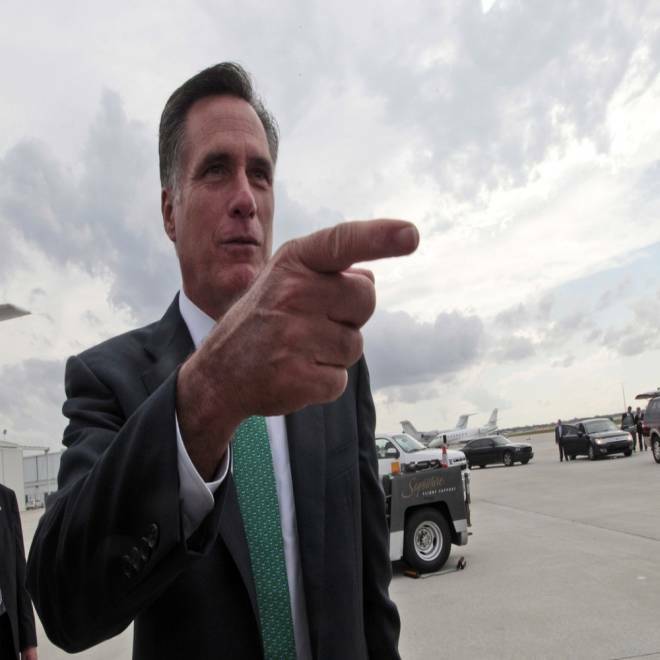 Mitt Romney, gestures while speaking to reporters on the tarmac after arriving in West Palm Beach, Fla., Thursday, May 17, 2012. *** … On Bain, Romney’s $40M, Wright, and the debt ceiling: We also learned that with the second story of the week -- the Romney/RNC’s $40 million haul in April -- they’ve caught up to Team Obama VERY quickly in the money chase. Given all the GOP outside money, that has to concern the folks in Chicago, and it puts pressure on the Obama grassroots machine to start pumping out even more money. The fact is: The Obama campaign isn’t going to have the ENORMOUS financial advantage they enjoyed in 2008. A third story of the week was that proposed Jeremiah Wright ad, and the big lesson it taught us is the power that outside money is going to have in this election, even if no one ends up airing such an ad. In addition, we told you that such an ad could consume the Obama-Romney race, and the mere discussion of it consumed an entire day. Considering how toxic the idea was treated by the media and the Romney campaign and many other Republicans, it’s pretty clear Rev. Wright will be confined to the conservative media world. And the fourth big political story was House Speaker John Boehner raising the prospect of another debt-ceiling showdown, which reminded us how potentially important the lame-duck session is going to be after the November election. *** One more thing we learned this week: What we learned last week and this week is how hard it is for both Obama and Romney to stay on their own messages. Both had their best-laid plans for the week stepped on in various ways. Last week, gay marriage did that to Obama. This week, the debt ceiling and then Ricketts did that for Romney. It’s just never easy to stay on message (and it’s hardest part of a presidential campaign). The good ones figure out what to ignore and what to jump on. *** Romney’s first general-election ad: Meanwhile, Romney is up with his first TV ad of the general election. And as he suggested yesterday, it’s a positive ad. “What would a Romney Presidency be like?” the narrator asks. “Day One, President Romney immediately approves the Keystone pipeline, creating thousands of jobs that Obama blocked. President Romney introduces tax cuts and reforms that reward job creators, not punish them. President Romney issues order to begin replacing Obamacare with commonsense health care reform. That’s what a Romney Presidency will be like.” What’s particularly interesting are the four states where this ad is airing (at a buy of $1.3 million) -- Iowa, Ohio, North Carolina, and Virginia. *** And its Spanish-language component -- in North Carolina: We’ve pointed out how the Romney campaign and its allies haven’t responded to the Obama camp’s big push on Spanish-language TV. Well, this new ad has a Spanish-language component. But so far, according to SMG Delta, it’s airing in just one market (Raleigh, NC) at a buy of only $3,000. Interestingly, the campaign has still not countered the Obama Spanish-language advertising in Nevada, Florida, or Colorado. And unlike those Obama ads, it’s not necessarily targeted to the Latino community -- it’s just the new ad translated to Spanish. *** On the trail: Romney stumps in New Hampshire, holding an event in Hillsborough at 1:30 pm ET… And President Obama goes to Camp David, where he will meet G-8 leaders. *** Quick G8/NATO preview: This week’s back-to-back summits initially were supposed to be about the announcement of the 2014 combat troop withdrawal from Afghanistan. But that news leaked out MONTHS sooner than the administration planned. Now, about the biggest news that could come from this weekend’s meetings is the G8’s collective decision to release “global” oil reserves: similar to how the Obama administration released the Strategic Petroleum Reserve supply the last time. They did it under the cover of a “global” effort, rather than have it looked totally political and domestic. Given the Iranian sanctions issues, there is a rationale for the G8 countries to want other oil on the market to keep the price down. Bottom line: Don’t be surprised if SPR is done this weekend, which, in turn, could blunt the usual Memorial gas price rise and take that media catnip issue off the tape. The bigger lifts for the president at these summits are twofold : 1) working with Germany’s Angela Merkel on the Eurozone’s issues 2) in this age of austerity, raising money from other countries to help offset the costs of supporting Afghanistan from 2014-2024 as the U.S. has already committed to. *** Jim DeMint’s rough week: Folks, it was a tough week for Jim DeMint, given that the candidate his group sent money on in Nebraska’s Senate GOP contest -- Don Stenberg -- finished third. That result spurred this comment from Nebraska Sen. Mike Johanns, per Politico: “The question I’d get asked as I get around the state: ‘Who is this guy [DeMint] and why he is spending this money to elect people in our state?’ … I just think it was a poor choice of strategy. I don’t think they understood the state. People hate that kind of stuff in our state, and so they recoiled, they looked for an alternative.” Ouch. The lesson here: When you play this game and lose, people are going to gloat. *** Americans Elect … no one: Yesterday, the third-party group Americans Elect called it quits. What’s interesting: The idea of a third party has never been greater, and there’s never been a better-financed vehicle (in terms of ballot access) than Americans Elect. But it didn’t work. What we’ve always heard: “If you build it, they will come.” Well, guess what: They built it, and the candidates didn’t come. Every recruiting effort we know of started off well enough (insert obvious ex-Democrat or ex-Republican lawmaker here), but then that ex-lawmaker would back away for fear of two things: 1) that they couldn’t win; 2) their candidacy would hurt their former party’s nominee and they’d be blamed forever for it. *** NC GOV ad war: In North Carolina, the group NC Citizens for Progress – funded by the Democratic Governors Association – is up with a TV ad hitting GOP gubernatorial nominee Pat McCrory. It’s in response to a Republican Governors Association-funded ad hitting Dem nominee Walter Dalton.